It’s funny, but I’m not sure whether to consider this a landscape, seascape or “nautical”. Certainly the theme is nautical. There are no sea or land elements in the painting, but there is a boat – so I guess it’s a nautical! 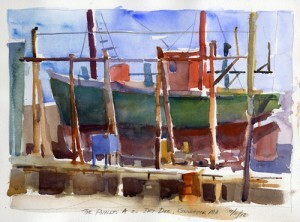 I was able to enjoy four days of painting in the Cape Ann area of Massachusetts recently. Cape Ann includes the picturesque shore towns of Gloucester, Rockport, Manchester-by-the-Sea and Annisquam. It’s one of my favorite places and one of my favorite places to paint. 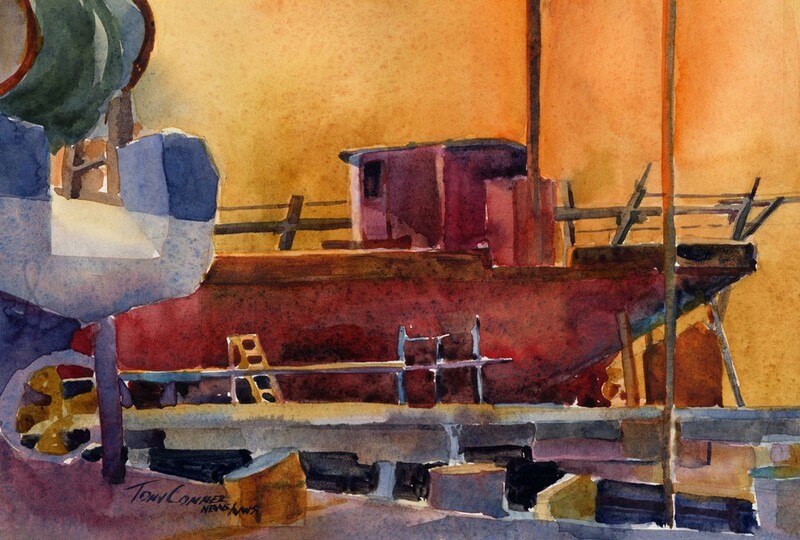 One evening, my friend and fellow painter John Caggiano and I set out for the Gloucester Marine Railways. It’s an odd name for a ship repair and drydock company, which is what it really is. But whatever it is named, it is a great place to paint since there are always a variety of boats up for repair. One boat in particular is the “Phyllis A“. It is Gloucester’s oldest fishing vessel and has been preserved to promote the history of gill-net fishing in Gloucester. Visit the website for the Phyllis A here – and donate to the cause if you have a mind. I’ve seen it a number of times while visiting the shipyard. Although it actually spends a great deal of time in the water, I happen to have seen it out of the water, in drydock, three times in the last three years. This sketch was done in July 2012, up in the very same drydock as the painting shown above. The sketch was actually done in the morning, while this latest painting was done in the evening. As an old boat, it is in constant need of repair, and is also in the process of restoration, so it spends a lot of time in drydock, I suppose. We visited the yard one evening and set up with the light disappearing rapidly – more rapidly than we had anticipated. The Phyllis A was up in drydock and in the exact same place as I found her in July 2012. There was another boat – a modern fishing boat – up in the dock next door. The sun was sinking in the sky but still shining on most of the yard. I set up in the shadow of a crane so that I had a good view of the Phyllis A and it’s mate in the next dock, but on their shady sides. The sun was just catching the front edge of the cabin and the roof over hang cast a shadow across the side. Most of the rest of the boat was in shade, as was the stern of the fishing boat which can be seen on the left in the painting. With slanting light from the low sun, and my vantage point, it was possible to sense the color temperature differences between shady areas and areas lit directly and indirectly by late evening sun. In the painting, the contrasts were enhanced by pushing temperature differences. The lit areas were painted in warm colors, and shade areas in cool, enhancing the sense of late evening light. Offered to you direct from the artist online for $225. This special pricing is possible 1) because I don’t have the expense of framing, transport, other costs associated with gallery exhibitions and 2) I can split with you the commission I would normally pay to a gallery. This painting is approximately 7″ x 10″, mounted and matted to the standard size of 11″ x 14″.